Before coming to Japan, I was really excited to see this one of a kind place where tradition and technology seemingly go hand in hand. I was expecting to feel overwhelmed at the size and advancement of this metropolis, finding something new and surprising at every turn. Soon upon arrival however, we almost felt slightly cheated. It was not as different as I had expected, its technology and speed of life resembling most major cities I’ve visited or lived in. Sure, it was interesting, and like most megalopolis it came with its own flavour and unique quirks, but despite liking it here, my husband and I soon found ourselves looking forward to exchanging Tokyo for Kyoto. We still had one last evening in Japan’s capital before catching the Shinkansen to the former central city of this island nation and we decided to do something fun. Instead of running towards the noise and bustle of the big city, as we tried to escape what we had everyday in London, we decided to look for something more low-key yet interesting. Determined that we should try to experience something typically Japanese, which we would be unlikely to see back home, I decided to visit the Konica Minolta Planetarium. As we walked out of the Ikebukuro station, the sun was finishing its daily journey. 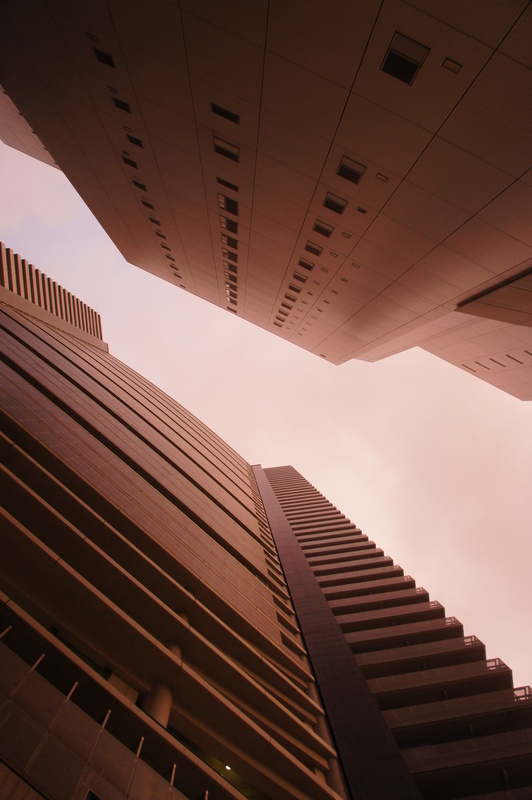 The tall sky scrappers of the Sunshine City began to have their smooth surfaces turn warm shades of pink and lilac, giving the area a serene feel. For one of Tokyo’s main shopping and entertainment areas, the Sunshine City seemed surprisingly calm. We had to pass through the shopping centre to get to the top floor of the high-rise building to get to the planetarium. The mall wasn’t busy and we decided to walk around the shops and grab some gyoza before the screening was about to start. The planetarium turned out to be completely different from what I had expected. Rather than scientific facts about the planets, it was showing movies with only lose ties to the sky and space. We had been given two choices- a violent Japanese sci-fi or something known as the Healing Planetarium that promised a relaxing journey through the starry sky. Obviously, we chose the latter. As we entered the round room with a high-dome ceiling, we were given blankets and headphones, so that we can hear the movie narration in English. The seats were comfortable and we reclined them to an almost horizontal position, following in the footsteps of the Japanese visitors around us. Upon the start of the movie, or a computerised cartoon to be more precise, we were taken on a tour to Japan’s forest where we were being shown different constellations that can be spotted on the night sky. To support the relaxation the air was filled with gentle herbal scents that were sprayed throughout the screening. As we listened to the soft voice of the narrator and watched the slowly changing digital landscape of the night sky, I couldn’t help but notice the irony of it all. Instead of experiencing the actual nature, there we were- trapped amongst concrete, dreaming of nature we abandoned for the false promises of the city, paying money to see a poorly made digital copy of the starry night we could see for free if only we headed out of the city centre. When the movie finished, I felt relaxed and ready to go to bed, the experience having been a pleasant one, yet somewhere deep down I knew something in my soul had been stirred by this evening. I needed nature. I needed the perspective it could offer, the connection it could provide, with the real world, with me. We keep on rushing through our lives, constantly focused on saving time and increasing efficiency. And as we run through our concrete jungles, we forget the freedom we traded for comfort. We become disconnected from the world around us, slowly loosing the remnants of intuition that was once strong. Forgetting that we are part of this symbiotic universe, we start to put our needs ahead of the planet’s, and in the process of destroying our home, we destroy ourselves, becoming lonelier than ever before. It is no surprise that between loneliness, high social pressure and history of honourable death, Japan still remains a country with one of the highest suicide rates in the world – a grim fact of which we were reminded at the underground stations that have the jump-preventing barriers. In 2014, on average 70 people committed suicide every day, most of whom were men. Although suicide still continues to be one of the leading causes of death in young working men and remains to be almost three times higher than in US or UK , the numbers have began to decrease over the last few years. Part of the reason for the lowered death rates might be the arrival of the gatekeepers. Inochi no monban, or a “gatekeeper for life”, can be anyone who had been trained to address suicidal tendencies in public places. Japanese citizens from all walks of life can attend the government-funded gatekeeper program where they learn how to spot troubled souls and how to encourage them to seek professional help. Seeing government investing in addressing the issue of suicide is truly commendable, but it leaves me wondering – as with any problem, should we not be addressing the causes rather than symptoms? In my years of psychology work it became painfully obvious to me that we are great at driving ourselves to destruction. We literally work ourselves to death, suffering from depression and anxiety due to stress and lack of social support. Perhaps we shouldn’t wait until we get approached by a gatekeeper, but actively seek to create a life humans were meant to lead – one filled with real connections and real experiences in the real world. I was looking forward to the next day when we were to part our ways with Tokyo and spend time in Kyoto instead. I believed the names of these two cities were each others’ opposites for a reason, and as I was soon to find out – I was not mistaken.